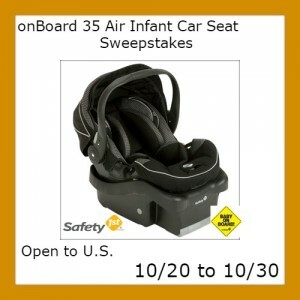 *OVER* onBoard 35 Air Infant Car Seat Sweepstakes! Hosted By Tammie's Reviews, Giveaways and More and Priceless Product Reviews, Giveaways and Freebies. If you have babies then I am sure you know of Safety 1st. Safety 1st is a company specializing in various products to keep your baby safe in a car, at home or even on the go. 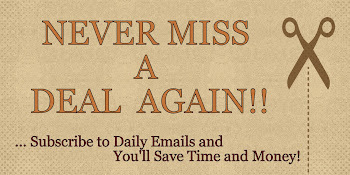 Safety 1st also information on various topics and subjects. You can read Tammie's post on Car Seat Safety Tips by going HERE. Importance of Rear Facing In March of 2011 the American Academy of Pediatrics (AAP) updated their car seat recommendations advising that children should remain rear facing until the age of two. According to a study in the Journal of Injury Prevention children under the age of two are 75% less likely to die or be severely injured in the event of a car crash if they are rear facing. When a child is rear facing their head, neck and spine are better supported and in the event of an accident, crash forces are distributed over the child’s entire body. Location Typically the center rear seat is the safest place for a car seat, and never install a car seat in the front seat. If your car does not have a latch connector for the middle seat, you can use the middle seat belt to properly secure the base. When installing, make sure the base of the car seat moves no more than an inch from side to side. An easy way to test this is to hold at the belt path. Car Seat Expiration Car seats do have an expiration date, it is recommended that car seats be replaced every 5-8 years, or immediately after a crash. The reason for an expiration date is because plastic can warp and materials can fray, which can make car seats not as effective in the event of a crash. Additionally car seat technology and state and federal car seat regulations change over time. Important warning labels may wear out and instruction books may get lost, which can lead to improper use of the car seat. Safeguard the Car Childproof the inside of the car and eliminate projectiles. Anything in the car that is not secured is a possible projectile – even a child’s toy, or a water bottle. In a crash, objects take on greater weight due to crash forces. This will end on 10/30/2014 at 7 p.m.
Disclosure- The Cafe Coupon was not compensated either by free product or payment. I have not been compensated for this post. All opinions and experiences are my own. Open to the US, must be 18+. Confirmed Winner(s) will be contacted by email and have 24 hours to respond before a new winner will be drawn. No purchase necessary. Void where prohibited by law. away. Sponsor will be responsible for prize fulfillment. This event is in no way associated with, sponsored, administered, or endorsed by Facebook, Twitter, Google, Pinterest or any other social media network. The disclosure is done in accordance with the Federal Trade Commission 10 CFR, Part 255 Guides Concerning the use of Endorsements and Testimonials in Advertising. For questions about this giveaway or to have me promote your product, Please email Tammie at info@tpankuch.com.